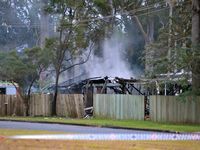 AN 11-YEAR-OLD girl was rescued by police moments before an explosion tore apart a Beerwah home. On a day commemorating the brave actions of a fallen comrade, two on duty Beerwah police officers have dragged the girl, who was wearing a local school uniform, through the Beerwah parade residence front gate to safety. 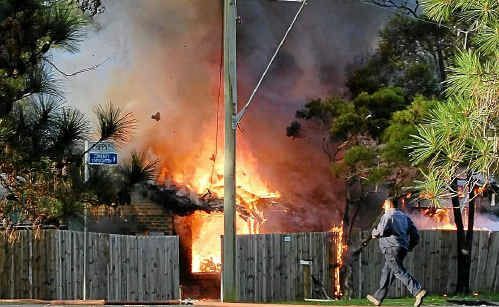 Moments later the house was ripped to pieces by an explosion felt 300 metres away. Dozens of nearby workers and residents flocked to the scene shortly after the blast, which one woman heard from more than a kilometre away in Shaws Road. The force of the explosion tore the roof off the house and scattered broken glass and debris tens of metres away. It took a dozen fire-fighters less than an hour to bring the blaze under control, but the surrounding streets were cordoned off well into the night. Neighbours faced a nervous wait for several hours before being allowed to inspect the damage done to their homes. Curtis May-Kuronya was house sitting directly opposite the Beerwah Ave home. The 20-year-old had just come home from shopping with his girlfriend and was giving his two dogs a bone in the backyard when he heard a “a commotion”. “Next thing I heard a young girl screaming. There were two police officers that got her out of the house and sent her over to her mum,” he said. “Police then rushed over and told us to get the dogs and get inside the house. 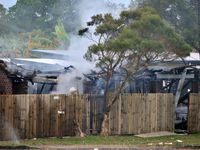 Ethical Standards Command Brisbane Inspector Jason Overland confirmed the explosion had claimed the life of the male occupant. He said the Ethical Standards Command would investigate the circumstances surrounding the incident. The child is believed to live at the residence with her mother. The mother was not at home at the time of the fire. A 33-year-old man, who is believed to be the mother’s ex partner, died in the explosion. There were reports today that the 11-year-old girl had been tied to a chair before she was saved. 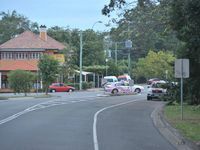 But witnesses also told the Daily the child had attempted to run back into the house before the two Beerwah police officers removed her from the residence. 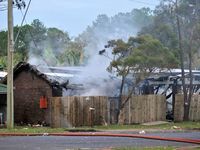 Nurse Michelle Taylor, 34, was in the nearby IGA store when he heard the explosion and turned to see thick black plumes of smoke. Ms Taylor said she rushed to the scene and assisted a man who had suffered a sprained ankle. 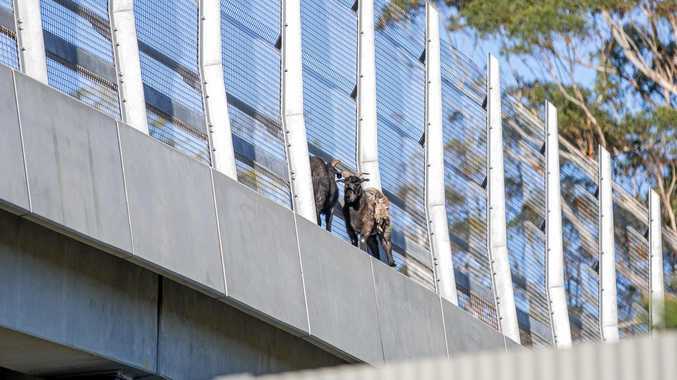 “He was in shock at the time, but he kept saying he thought his girlfriend might be inside the house,” Ms Taylor said. Anyone with information which could assist police should phone Crime Stoppers on 1800 333 000. Readers seeking support and information about suicide prevention can contact Lifeline on 13 11 14 or MensLine Australia on 1300 78 99 78.